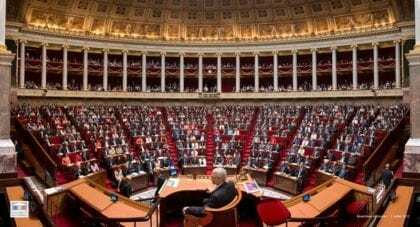 A law proposal, named “experimenting over the territory in order to implement a basic income”, was presented to Parliament (Assemblée Nationale), on the 31th of January, 2019. Although government had announced the will to promote such experiments, a majority of MP’s from the party in power rejected the debate before it even started. Concretely, the proposal was rejected by a majority of MP’s mainly from LREM, LR and UDI (Note 1). The proposal was presented by the party Groupe Socialistes & apparentées, a minority group in Parliament whose history goes back to 1893, and supported by other 17 socialist groups. This almost three-year-old project has been initiated by Gironde’s president Jean-Luc Gleyze, building upon a growing national debate on basic income. In a twisted tint of irony, the discussion of this issue is being blocked by the same party which has declared its openness to amplify its debate in France. Specifically, a “preliminary rejection motion” has been presented, momentarily cutting the avenues for discussion in Parliament. Although most MP’s have agreed, over time, that direct cash transfers would eliminate social benefits non-take up (in France, 36% of all eligible beneficiaries for social benefits do not take them up, due to ignorance and administrative complexity), the unconditionality feature of basic income was rejected by most. To them, it is the responsibility of the citizens to search for jobs, which are seen as “a cornerstone in individual liberty“. In other words, most LREM MP’s believe that people will be idle if they receive an unconditional basic income, which boils down to the most frequently held criticism over the policy (and a pessimist-laden view on human nature). On the other hand, the Movement Français pour un Revenue de Base (MFRB) (French Movement for a Basic Income) sustains that it is precisely the basic income that allows people to acquire rights, in such a monetized society. Furthermore, the MFRB has declared full availability to work with MP’s in order to establish the possibilities for experimenting with basic income in French regions. As for the law proposal itself, before rejected it was subject to several change propositions, sixteen in total. These changes aimed to shift the universal grounds of the proposal to an age cohort of 18 to 25 years of age, and to erase all mentions to unconditionality. Even the title was targeted, with a change proposal from “un revenue de base” (a basic income), to “une prestation d’accompagnement à la vie autonome” (a benefit to support an autonomous life).